2008 is the year of the Mouse/Rat according to the Asian Lunar Calendar. Jikkan Junishi (literally 10 stems and 12 branches) refers to the Chinese zodiac symbols, also called eto in Japanese. 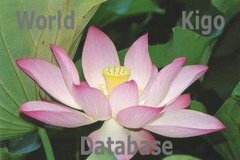 The 10 heavenly stems referred yin-yang principles and the elements of wood, fire, earth, metal and water. Once full circle compirzes 60 years. The 60th birthday of a person completes one circle. This year will be my Kanreki ! This animal is with us all year round ! The mouse is one of the animals that are found all over the world. It has good vitality and gives people the impression that it is smart,nimble and filled with enterprising spirits. People born in the year of the mouse share some of the characteristics of a mouse. They are optimistic,cheerful, do not fall into low spirits no matter how hard the circumstances,and will fight for their lives. At the same time, they are sensitive like a mouse, and have good intuition and imagination, but they are not good at logically drawing their own conclusions. Viewed from appearances, people born in the year of the mouse are reticent persons, but actually they are not. They are easily worked up, but they can control their spirits. This character allows them to have lots of friends. People born in the year of the mouse are usually optimistic, cheerful and easy to get along with. Sometimes you may find a person born in the year of the mouse to be critical, complaining and fault finding. But generally speaking, people born in the year of the mouse are easy to get along with. You can find them in circles of close friends and they are usually very friendly. People born in the year of the mouse treasure their relationships with friends and relatives. Sometimes you will find that they connect their lives closely to those of others. This is because once they like somebody, they can't bear to leave them. People born in the year of the mouse have a natural instinct for loving money. A boss born in the year of the mouse will care for his employees. He makes sure his employees participate sufficiently in sports and that they maintain a balanced diet. When his employees are sick, he will go to see them. He takes the troubles of employees as his own. But things change as soon as his employees want to talk about raising their wages. Then he becomes a miser. If you want to get money from the person born in the year of the mouse, you will need to bargain with him very hard. A woman born in the year of the mouse is usually surprisingly frugal. She buys second-hand goods, splits one meal into several, and cuts down on expenses. Of course, if there is real need for money, she will not be stingy. Sometimes, people born in the year of the mouse live in groups. They don't care if there is another mouth to feed. They will let friends or relatives live in their homes, but they can always find something for them to do. They even let lazy-bones and beggars move in and they provide work for them to do in their houses. People born in the year of the mouse are able to keep secrets, but they enjoy finding out the secrets of other people. They may use such information as a weapon and are not satisfied until they have achieved someone's destruction. They seek loopholes without feeling shame. In a word, they lose no chances. Since such a person tries his best to hide his feelings, when his mood changes he will be confused, and not always know why he is angry or worried. The cause may be just because people born in the year of the mouse are active and diligent. They would be unhappy and angry about other people's laziness and waste. The character of people born in the year of the mouse has its positive and negative side. They are too particular about trifles, criticize others too much and bargain too much. They usually buy things that they don't really need. They are often cheated by others. They also keep many mementos in their rooms, and keep distressed memories in their hearts. Maybe this is because of their desire to accumulate. Although they are willing to poke their noses into other people's business, they mean good. People born in the year of the mouse have good memories. They like to ask questions and have keen insights. Such a person knows almost everybody and keeps everything around them in mind. Others take it for granted if a person born in the year of the mouse becomes an excellent writer. People born in the year of the mouse can succeed in everything because they are as clever as mice. They are able to overcome all kinds of difficulties, and face dangers fearlessly. Because of their cool and quick-witted minds, their keen insight and deep understanding of life, defeats in life sharpen their minds and make them out of ordinary. There is no need to worry about the security of the person born in the year of the mouse. Before he will make any deal, he will leave a way out for himself. In times when things out of the ordinary happen he can overcome trouble almost immediately. An instinct for protecting himself takes the most important place in his heart. Usually his plans take little risk. So if you want to avoid trouble, follow the advice of a person born in the year of the mouse. Main stumbling block standing in the way of such persons is their wild ambitions. They want to do too many things at the same time, and so they diffuse their energies. If they are able to develop their strong points and avoid their weak points, they will gain great success. Although people born in the year of the mouse are able to foresee dangers, their fondness for bargaining may cause them to draw wrong judgments, and even fall into traps. If they can overcome their greed and be self-restrained, their lives may become plain sailing. But before they realize that greed will do more harm than good, they may suffer at least one disaster of losing a large sum of money. Yet they will not become penniless because they will extricate themselves from such a difficult position. Among the "twelve animals," the mouse is the most sentimental. So he is not only attached to his children but also to the elder members of his family. Children born in the year of the mouse are considerate towards their parents, trust their parents and forgive any mistakes of their parents. A mother born in the year of the mouse is a good house-wife and can help her husband's work a great deal. However she will spoil her children and will pay too much attention to her husband. 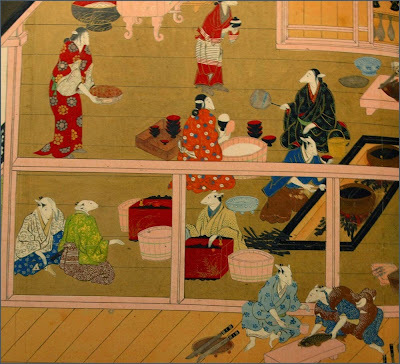 Nehyōe, the mouse-husband, is carried off by a goose while trying to satisfy his pregnant mouse-wife’s craving for meat cut from the bird’s right shoulder. Sister Toad and Lady Mole are summoned to help, while meanwhile Nehyōe wanders the countryside composing poems of lament. At long last, Nehyōe is rescued and sent home in a boat, and the mouse-couple lives happily ever more. 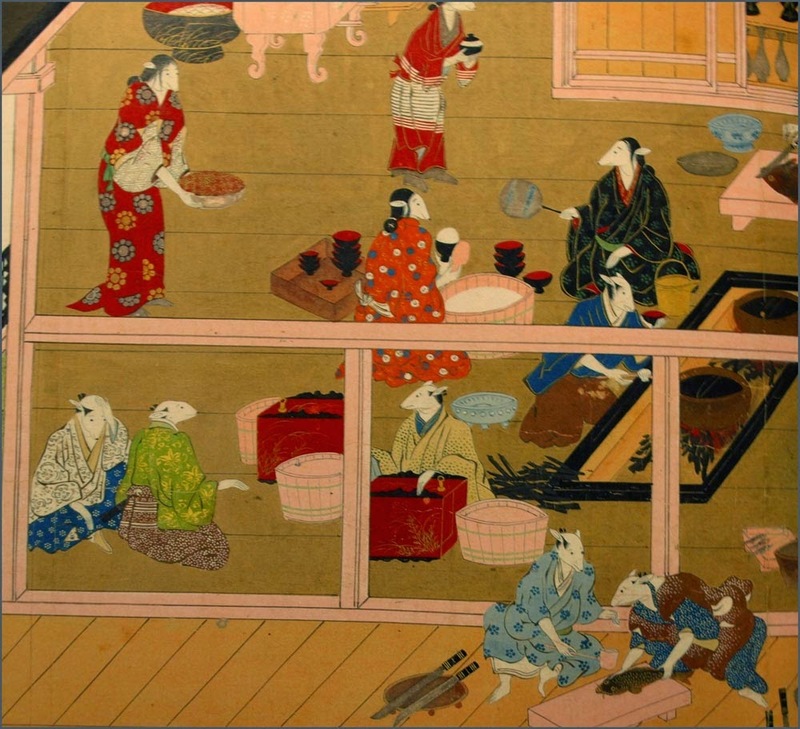 White mice like Nehyoe,the hero of this tale, were believed to be messengers from Daikokuten, one of the seven gods of good fortune. It was customary to read Nehyoe's auspicious story on the occasion of the New Year to usher in a new era of success and prosperity. year of the mouse !
. Nezumi 子 / 鼠　Rat, Mouse Amulets . Gabi, am I correct in assuming that 'mouse' is not a kigo in the Japanese tradition? Here mice make appearance in the house in winter, and it seems natural to associate them with this season. No, the mouse just like that is not a kigo in Japan, it is with us (and a prey of my cats ) all year round. They could be a kigo for winter in Europe, as you say! Thanks!!! and may they stay out of your own grain storage.